The process of finding the right starting point or next step in getting more performance for your MINI Cooper or Coooper 'S' can be confusing. To help narrow your search, begin by identifying your driving style and performance goals, then choose products which fit your needs. For detailed, step-by-step instructions on modifying your MINI for optimal power and handling, you'll want a copy of MOTORING. In the mean time, here are some basic pointers on options that are appropriate for your driving level and interest. The BMW MINI is a spectacular reincarnation of the classic Mini Cooper.The short wheel base, rigid chassis, light weight, combined with BMW engineering results in an exceptionally well handling car straight from the factory. The stock design makes some compromises for the masses, being a delicate balance of performance, comfort and cost.But the stock MINI provides an excellent platform for the enthusiast where upgrades can transform the car to nothing short of phenomenal. As with any internal combustion engine, horsepower and torque are increased by improving flow of air and fuel into and exhaust gasses out of the engine. Reducing rotational mass of engine and drive train components improves ‘responsiveness’ for better throttle response and all around drivability. Each upgrade provides an incremental increase in performance, but a ‘systemic’ approach offers the highest gains. For the 1.6 liter supercharged engine in the MINI, the typical and proven sequence for upgrades are listed below. You can install each piece individually, or install one of Mini Mania’s Stage kits for R52, and R53 MINI Cooper S modelsfor the best performance at the best price. STEP 1: Cold Air Intake - The Mini Mania Cold Air intake improves flow by greatly increasing the airbox and filter size while maintaining air intake from outside the engine compartment. The airbox uses polished stainless steel for its exceptional heat shielding qualities. For detailed information, see Item NME2030. STEP 2: Cat Back Exhaust - Mini Mania offers three different stainless steel low restriction cat back exhaust systems with mild, medium, and aggressive exhaust tones. All three systems offer greatly reduced back pressure while maintaining gas velocity for optimum performance. Items NME1020 for R53 models, and NME1021. STEP 3: Supercharger Pulley Upgrade - Mini Mania uses a 15% reduction pulley that maximizes the supercharger speeds without exceeding specifications. Reducing the pulley diameter increases the supercharger revolutions at a given engine speed, resulting in a higher boost pressure and delivering more horsepower at that engine speed.This Pulley upgrade essentially moves the horsepower and torque curve lower in the RPM range.Part number NME5041. STEP 4: ECU Remap - The Electronic Control Unit (ECU) manages all aspects of engine operation including air/fuel mixture, throttle ositioning and ignition timing, just to name a few.We offer the Shark Injector ECU upgrades which remap the software for optimal performance. STEP 5: Throttle Body Upgrade - The throttle body upgrade has a greater inlet diameter allowing more air to flow into the engine. The ECU recognizes the increased airflow and adds more fuel, resulting in more power. Part number NME6050. STEP 6: Performance Camshaft - The camshaft controls how much air and fuel enter and exit the combustion chambers. By increasing lift and duration, more air and fuel enters the chamber for a more powerful combustion. The Schrick Performance Camshaft optimizes lift and duration along with other parameters for greater performance using stock valves and springs. Part number NME6045. STEP 7: Exhaust Header - For off road use only. The exhaust manifold takes the spent exhaust gasses from the engine through a catalytic converter and into the exhaust system.The Mini Mania stainless steel exhaust header increases flow over the stock design.Using a hi-flow catalytic converter with the necessary flex joint, this header increases horsepower and throttle response. Part number NME1124 or NME1013. STEP 8: NGK Performance Plugs - The spark plugs ignite the air/fuel mixture once it enters the combustion chamber. A supercharged engine produces more heat due to the increased density of the air/fuel mixture.These ‘colder’ spark plugs reduces the combustion temperatures, thereby generating less heat. Part number NME3011. STEP 9: High-Flow Cylinder Head - The cylinder head serves to move the air/flow mixture into the combustion chamber and exhaust gasses out of the engine.Although the factory head works well, the flow can be increased through porting and polishing which increases the openings into and out of the engine, smooths the walls of the channels for less turbulence, and reshapes the channels for optimum flow. Better flow equals more power. Part number NME6003-P. 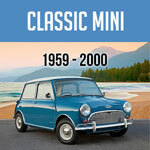 This is a comprehensive guide on products can extract more performance out of your Mini Cooper. 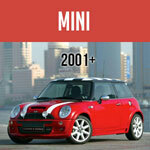 This article will list what types of upgrades are available for your Mini Cooper S.